As it’s name suggests, this trophy was presented to the Club by Roger Downing in memory of his Dad Brian. It is the most recent of the Club’s trophies being first contested for in 1994. The initial winner was Steve Richardson, who repeated the feat the year after. The remaining winners have been Steve Farrow, Phil Fern, Christian Jones, Mike Workman (3 times), Rob Bailey and Jonathan Beever. The trophy is run on the Bakestonedale hill (or Brickworks) starting just outside Pott Shrigley which was one of Brian’s favourite places. The competition has been run in one or two different guises, i.e. 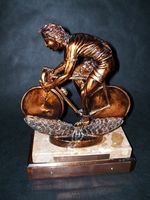 A straight one event hill climb or a winner calculated on the aggregate time over two out of three climbs. If there are any current members around who didn’t know Brian, you missed out! He was a wonderful character, never the fastest racer maybe, but that wasn’t his forte, he was a super-tourist, riding with his friends in many European countries. He also loved encouraging youngsters in the 4-Up team events. Sadly he was taken from us in a crash on the dreaded Gun Hill near Leek, only a few years after the same hill had caused the hospitalization of Pete Johnson and myself and severe cuts and abrasions to Maurice Green. Pete Wood was lucky to avoid the carnage that day.